Today I am over the top excited to share with you a recipe from the new cookbook, Everyday Cooking, from Minimalist Baker! 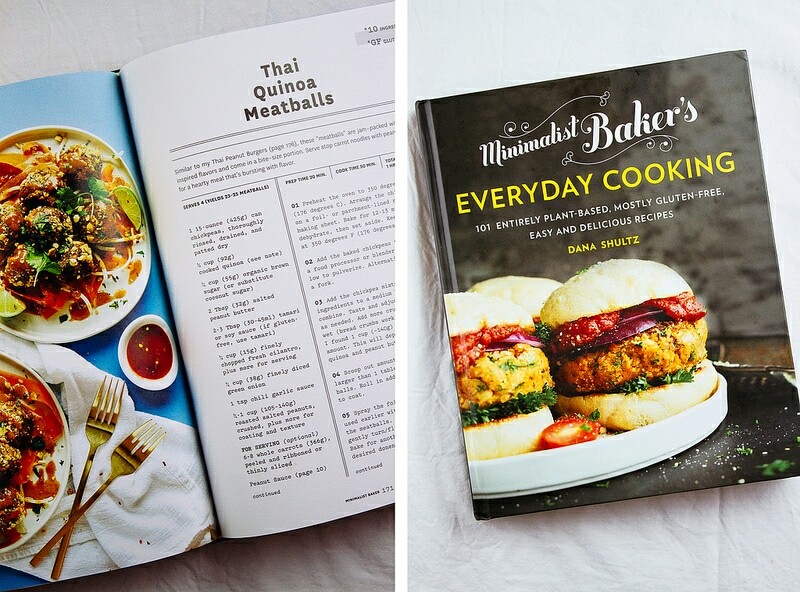 There are so many great recipes to cover in the cookbook but I decided to stick with the Thai Quinoa Meatballs. They jumped out at me first in the email I received about doing this post. Truth be told, it was in part the peanut sauce. I love me some peanut sauce! The combination of the two is what made me stick with this recipe over all the other amazing ones. And it did not disappoint! I followed the recipes exactly and everything turned out perfectly. The meatballs you see above are a glimpse before going into the oven. In her book, Dana suggests serving the cooked meatballs over carrot ribbons and drizzled with the peanut sauce. Super delicious! 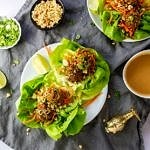 I wanted to stay along the same lines of freshness and decided to do lettuce wraps. Plus, they are something I’ve been wanting to make. And so it was, a perfect match! Another simple & delicious recipe to add to the collection! I know you’re going to love these as much as I do! 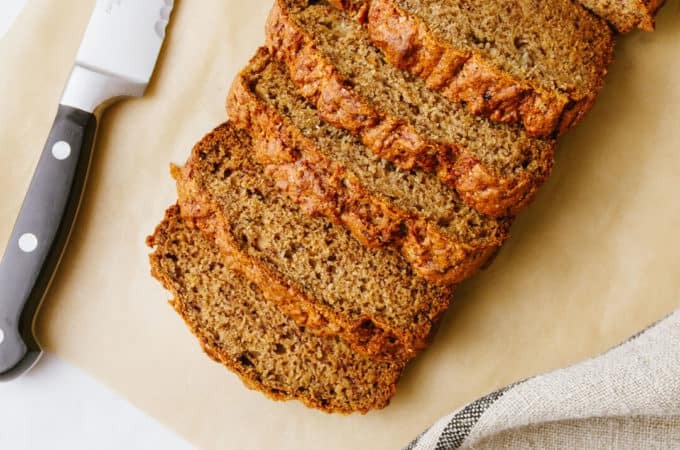 Thank you Dana for inspiring us every day with your blog, Minimalist Baker, and your new must have cookbook, Everyday Cooking! I am forever grateful. 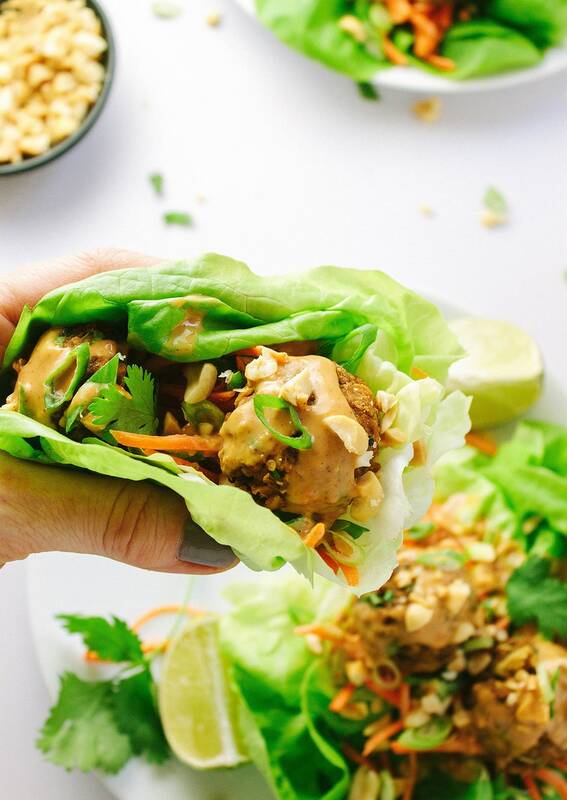 These flavorful meatballs featuring chickpeas and quinoa are a perfect filler for lettuce wraps! 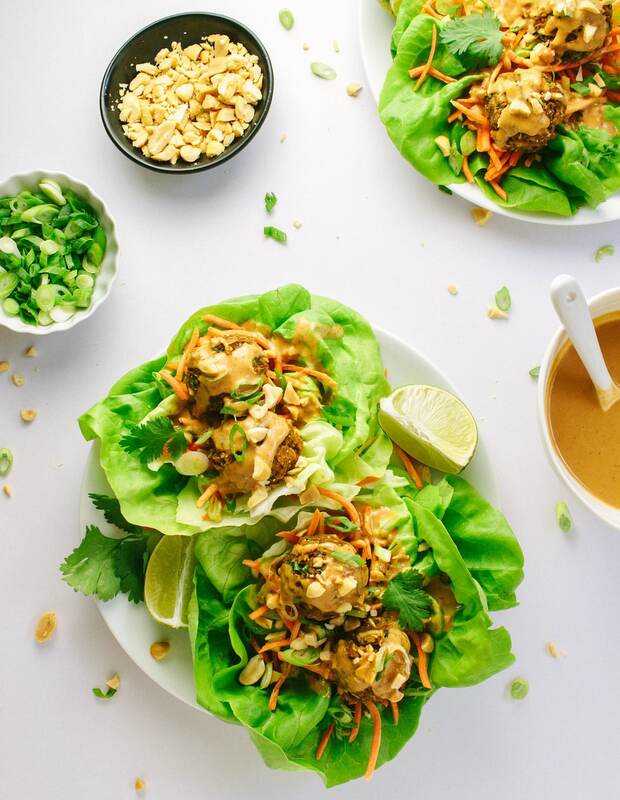 And it wouldn’t be complete without peanut sauce! 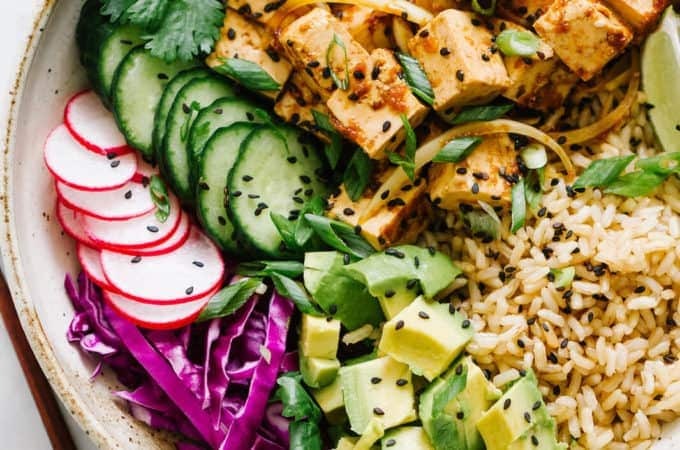 Recipe comes from Minimalist Baker’s new cookbook, ‘Everyday Cooking’. Dehydrate chickpeas: Preheat oven to 350 degrees F. Line a rimmed baking sheet with parchment paper or a silpat. 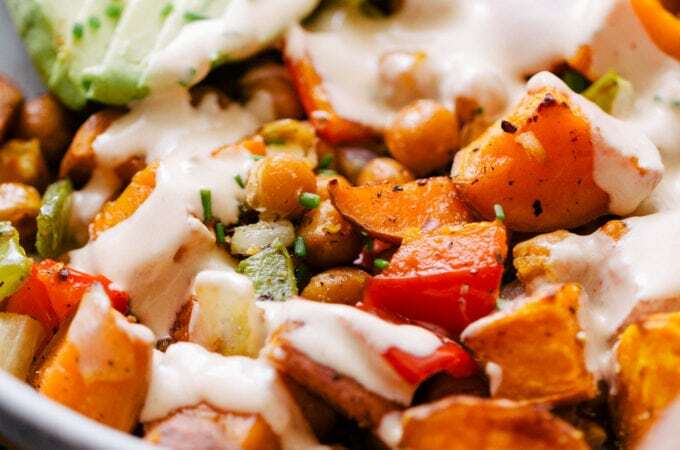 Arrange chickpeas in a single layer. Bake for 12 – 13 minutes, set aside to cool. Leave oven set at 350 degrees. Mash chickpeas: In a medium size mixing bowl, add chickpeas and mash well with the back of a fork (pulsing in a blender/food processor will also work). Mix the meatball mixture: Add in the remaining ingredients for the meatballs with the mashed chickpeas. Mix well to combine. Mixture should clump together after a minute or two of mixing. Take your time breathing in through your nose and take in all the combining smells. It’s so good! Taste and adjust seasoning as needed. If mixture is too wet, add a bit more crushed peanuts (a few tablespoons of breadcrumbs would work great too). I will depend on how wet your quinoa and peanut butter are. 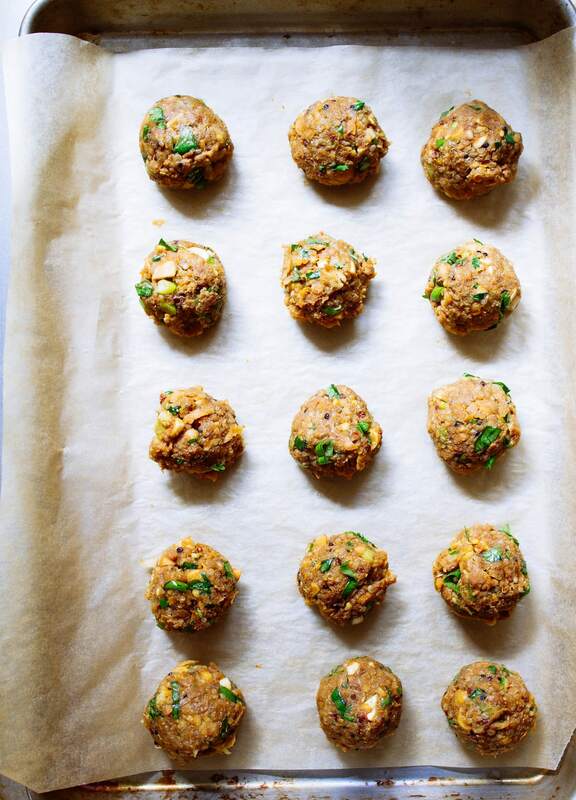 Roll meatballs and bake: Roll the mixture into 1 inch balls, using about 1 – 1 1/2 heaping tablespoons. I was able to get to 12. Roll each ball in finely chopped peanuts (I skipped this part). Place on the same baking sheet you dehydrated the chickpeas. Bake in the oven for 15 – 20 minutes, turning once during cooking. Make the peanut sauce: In a small bowl, mix the peanut butter, tamari, sugar, lime, garlic and chili sauce. Add hot water a tablespoon or so at a time until desired consistency. If too thin add more nut butter. 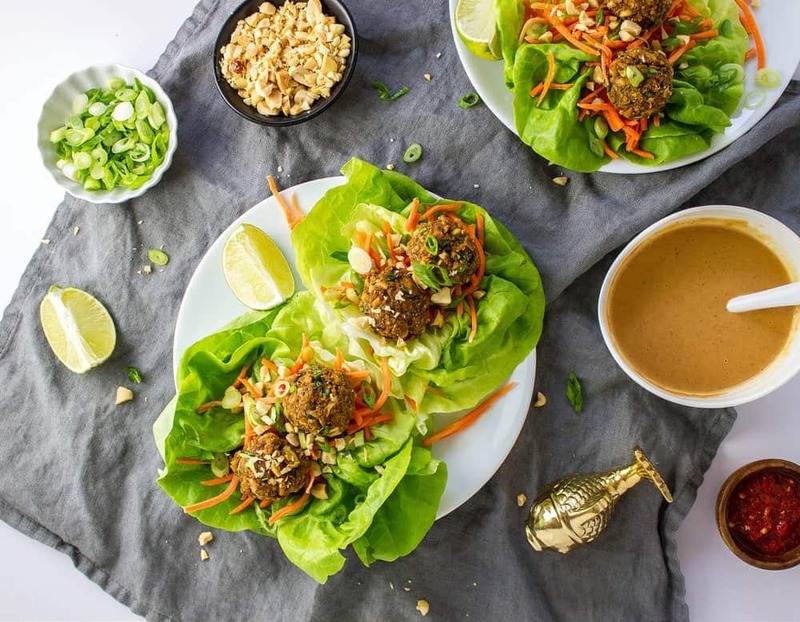 To serve: Place lettuce on individual serving dishes, top with carrots, meatballs, scallions, peanuts, cilantro and a drizzle of peanut sauce. Enjoy to the fullest! Dana suggested serving the meatballs over top carrot ribbons and topping with scallions, peanuts and the peanut sauce. Keeping it fresh, you could also do spiralized zucchini or cucumber noodles. You may also like to top them over soba or rice noodles with the peanut sauce as well. Anyway you serve them, they are delicious! Hello! I just bought your cookbook and this recipe is one of the first I’ll try! To clarify, is it 1/2 cup cooked quinoa, or 1/2 cup of quinoa, cooked? Looking forward to cooking more recipes from this book! I’m going to make this for my Monday night Prenatal Yoga Class with Dinner. Any suggestions for side dishes? I feed 15 people and anything I can make a few hours in advance would be great. I would suggest serving the Fresh Thai Salad with this. It’s both light and refreshing. Make it ahead of time and let it chill in the fridge, or serve at room temp. Adjust the dressing to your liking. 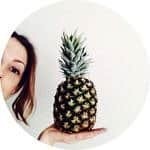 You could slice a pineapple in half and make a pineapple boat with plenty of toothpicks to grab the slices. If I think of something more, I’ll comment again. Have you tried freezing these after they are baked? I *think* they would be fine, but would like to hear from someone who has tried it. Wow, I just made the sauce and balls (I used white kidney beans in place if the chickpeas and toasted pumpkin seeds in place of the peanuts) and put it over spiralized zucchini and carrot. This is amazing! Thanks for a keeper. You see, despite having been subscribed to your site for quite a while now, I’ve somehow never mustered up the courage to a) compliment your beautiful work and b) ask you the one thing I keep wondering (about said beautiful work ;)). Therefore, I felt that needed to change, and now here I am. So. Being a huge fan of your photography, I was wondering if you’d mind sharing with me what camera gear you use and what you prefer to edit your images with? Obviously, I know that gear doesn’t matter -which I absolutely agree with- BUT; when looking for image quality it definitely does; it’s a completely different story, you know? Anyway, I hope you don’t mind me bugging you, and in case you reply, thank you in advance. I started out with the Olympus E-volt 510 and am currently using a Canon 7D as of last year (got a great deal). I use the standard canon 18-55mm and 100mm lenses. With both cameras I’ve taken some great, and not so great, photos. As you mentioned, it truly doesn’t matter what camera you use. I think good lighting is key, and I also like a decent pixel count for sharpness (which my Canon has). Having said that, even sharpness isn’t so much a factor at the moment with grainy and filtered looking pictures being a modern trait. Those filters can hide a lot! But I agree with you that image quality is key…and a high pixel count is a must for me for when I want clear, crisp photos.